April comes as a great, green relief to Vermonters who’ve been cooped up indoors for six months. But this April also offers the outwardly bound a few good reasons to stay inside. In the dark. From April 16 through 26, three eco-themed documentary films will be screened at local venues. The first, Garbage! The Revolution Starts at Home, appears at the Barre Opera House on April 16 and profiles a family that hoards trash for three months. Central message? That the domestic abode is “one of the most ferocious environmental predators of our time,” according to the film’s website. A Greenpeace solar truck will be on hand to power coffee makers — half off if you bring your own mug. Four days later at St. Michael’s College, Addicted to Plastic tours five continents, with a stop in the middle of the Pacific. Plastic attempts to show how the synthetic has caught humans and ecosystems in a “shrink-wrapped grasp.” The film is part of a weeklong Earth Day celebration at the college and precedes an April 21 Green Career Fair. On April 26 at Palace 9 Cinemas in South Burlington, the Vermont Natural Resources Council will screen the most thematically ambitious doc of all: Blue Gold: World Water Wars. The film addresses why the precious fluid is becoming less clean and available, which multinationals are trying to control it, how the resource issue will define global conflict in the 21st century, and who’s fighting the bad guys. It features Maude Barlow, a Canadian activist who testified in Vermont last year on a landmark law governing groundwater extraction. Garbage! The Revolution Starts at Home, Thursday, April 16, 7 p.m., at the Barre Opera House. Free. Info, 476-8188 or click here. Addicted to Plastic, Monday, April 20, 6:30 p.m., at Cheray Science Hall, St. Michael’s College in Colchester. Free. Info, 654-2536 or click here. 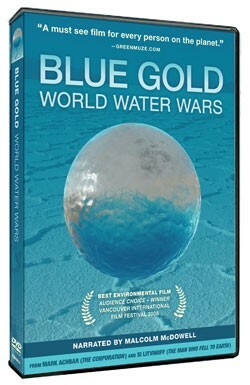 Blue Gold: World Water Wars, Sunday, April 26, 6:15 p.m., at the Palace 9 Cinemas in South Burlington, $10; and on Tuesday, May 12, 6 p.m., at the Langdon Street Café in Montpelier, donations encouraged. Info, 223-2328 or click here.